(Newser) – The chimaera, or so-called "ghost shark," is an elusive deep-water fish that has fascinated biologists for more than a century. Like its relative the shark, however, it's made of cartilage and thus rarely fossilizes, so little is known about its evolutionary past, reports Live Science. 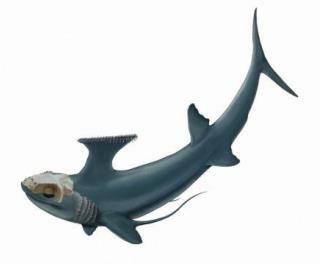 Now the blanks have been filled in thanks to a "remarkable" 280 million-year-old fossil found on a farm in Cape Province, South Africa, in the 1980s that was thought to be a symmoriid shark. Researchers at the University of Chicago Medical Center report in a ScienceDaily news release that the specimen—micro CT scan images of which one reviewer describes as "dripping with data"—is actually an early chimaera, not a shark. The specimen offers "a glimpse of the preconditions from which modern chimaeras evolved." Not sure how the name chimera fits this animal unless it is the physical difference between a standard fish/mammal that lives in the sea. Non human chimera need body parts that don't naturally occur on the subject animal. Maybe it need a better name.